These gloves were supposed to be a Christmas gift for my sister last year, but she didn’t receive them until this year. It’s not that I’m a slow knitter it’s just that I go through phases of wanting to knit. I added the final touch last night, the little heart buttons on the cuff. 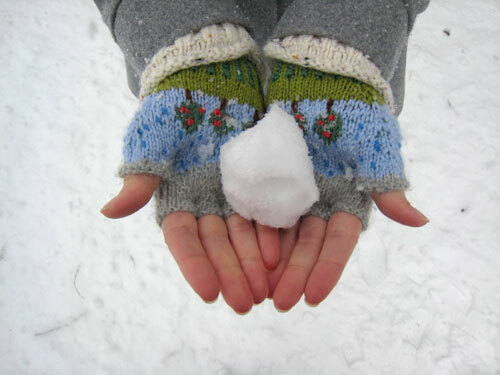 Aren’t they the cutest gloves you’ve ever seen! I’m so happy with the final product. 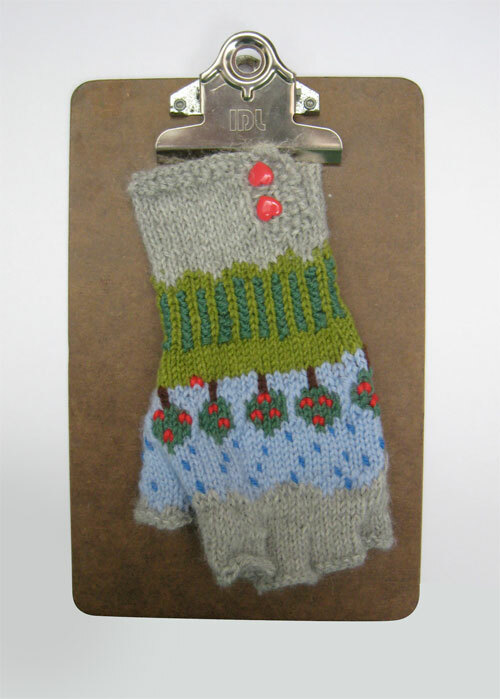 If you’re interested in making these, it’s a pattern from the Fall/Winter 2008 knit.1 magazine called Rainy Day fingerless gloves. 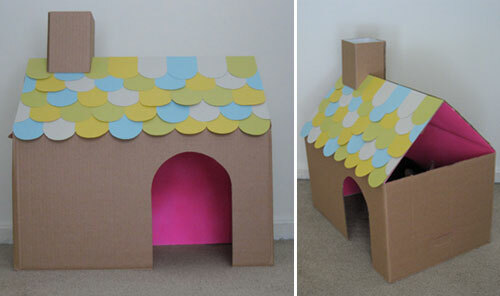 My second project is this cute little cardboard cat house that I made while watching the Golden Globes. 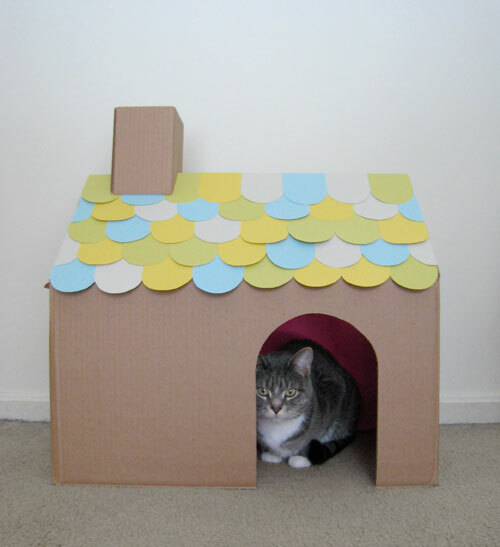 Basically I had been really wanting to buy my kitties a cardboard house or teepee from Loyal Luxe, but decided not to spend the money and just make one myself. I took a regular box and spray painted the inside hot pink and adjusted the flaps to make the roof. I left the sides of the roof open so then can jump in and out that way, if they please. The chimney was made with some of the leftover cardboard and the shingles with scrap paper I had around the house. The kitties love it (that’s Jesse James in the photo above) and it much better on the eyes in comparison to the regular old box I had left out for them. 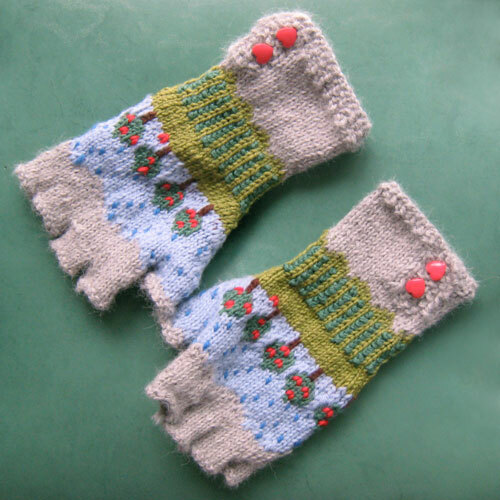 Tags: cardboard cat house, cat house, crafts, diy cardboard cat house, fancy seeing you here, fancyseeingyouhere, fingerless gloves, knit.1 magazine, knitting, rainy day fingerless gloves, sarah hanks, Sarah Hanks Ltd.